The good people at AAA said “Well, unless your father is there, there’s nothing we can do for you. You’re not covered.” Jose thanked the nice lady and hung up. After a moment he picked up and dialed AAA again. “Hi this is Richard Melendez and Richard needs a tow.” Jose said. 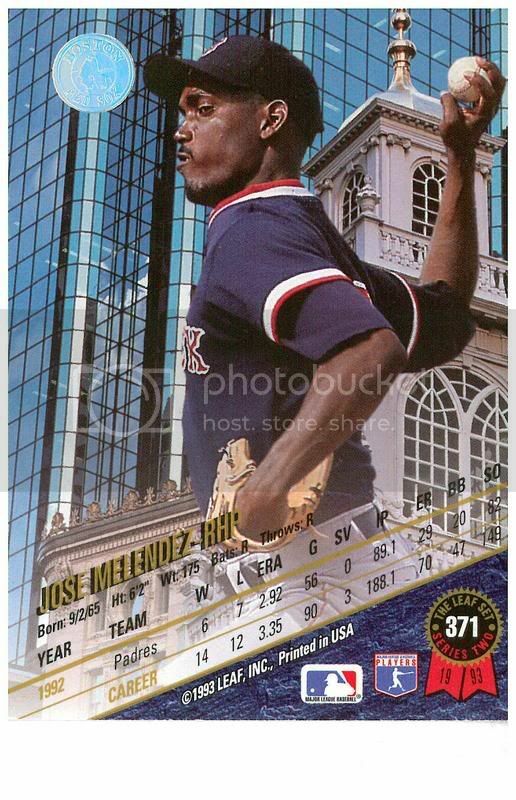 Instantly, and without question the customer service representative went right down the service check list and proceeded to treat Jose Melendez exactly like he was Richard Melendez. As you might imagine, Jose is gradually working towards a point here. Even if Curt Euro is unable to pitch game 5, the Red Sox should change their stated position and announce that he will pitch. Then, come game day, they should send out DLowe the Paranoid Android (newly tuned up) in a Curt Euro uniform and refuse to admit that it is DLowe no matter what. Theoretically, they could even remove DLowe’s face plate and replace it with some sort of Curt Euro mold. Now, Jose knows that it is a little hard to believe that the Yankees would buy into the charade, but if this election season has proven anything, it is that a lie repeated with conviction over, and over and over again can start to look like the truth to an awful lot of people. The Sox should also organize a stunt or two to further confuse the issue. For instance, at the press conference the day before game 5, DLowe should take to the podium in full Curt Euro regalia, possibly with Curt’s wife and children, and declare “I am not Derek Lowe!” (Note: This should be done in the style of the late Owen Hart when he would declare over and over “I am not the Blue Blazer.” Then, while Lowe/Curt is speaking, a DLowe look alike, let’s say, Data from Star Trek, Optimus Prime or an Erector Set, would walk buy in a Lowe Jersey. Faced with this striking evidence, the Yankees would have no choice but to believe that the fearsome Curt Euro was on the mound, and act as though he really was, in other words, with fear and anguish. You know what that means? Sure you do. It means that the Red Sox have gotten a hold of the way back machine and will be taking the rivalry into the time stream. After all, if it meant they were just dealing with this series, it would say “We can change the future.” Right now, Dave Roberts is in 1978 kneecapping Bucky Dent. Over in 1999, Pokey Reese has Tim Tschisa locked in a closet. And in 2003, Kevin Millar has Grady Little in a crippler cross face. But it doesn’t stop there. Gabe Kapler is in Munich 1933 preparing to take out Hitler. Bill Mueller is keeping guard at Ford’s Theater in 1865. In 1912, Alan Embree is slowing the Titanic. Okay, maybe, there is no way back machine (Note: And if there is would John Wasdin be suing the makers for trademark infringement? ), but the Red Sox would do well to remember the wisdom of St. Augustine. The past does not exist, it only used to exist. There is no game 1 or 2. There is no Grady Little. There is no what you had for breakfast this morning. The future does not exist either, it only will exist. There is no game 4. There is no Ortiz’s game 5 walk off. There is no game 6 come back. No, there is only the present, and the present has no breadth. It exists, but only in that it tends towards immediately not existing. And that is where Jose lives, and that is where the Boston Red Sox live. And regardless of religion, we join together in worshiping at the Temple of Right F’n Now. 3. As we all know, Fox nitwit Tim McCarver, thinks that Brandon Arroyo is starting for the Sox. Many have attributed McCarver’s error to genuine incompetence, but Jose has an alternative explanation. Jose looked at the TVLand listings and discovered that the Perfect Strangers marathon originally scheduled for Tuesday afternoon was replaced with a Punky Brewster marathon. Jose figures McCarver spent the whole afternoon watching the adventure of the plucky orphan, her curmudgeonly guardian Henry and her loveable dog Brandon and thus had Brandon on the mind when he went to the game. Now, Jose wants to make it clear that he is not apologizing for McCarver’s error. Frankly, Jose finds the idea that a man in his 60s would spend the whole day watching Punky Brewster, even more disturbing than the idea that Fox would have the worst announcer of this or any other generation calling the ALCS. Today, CSPAN is running a marathon of presidential debates so look for McCarver to speak quite a bit about Richard Nixon’s play in right field. Alternatively, if he was one of the 15 people watching CNBC last night, he could end up talking about Dennis Miller’s play at third base. From SoSH: Re: Game 2 Sox-Yanks -- Why Not Me? 3. So that’s the Herald’s take. Now let’s read between the lines of Dan Shaughnessy’s latest. This is Billy Budd territory. The Yankees are the evil and sinister Mr. Claggart, devious, cruel and manipulative. The Red Sox are Billy Budd the earnest young sailor working under Claggart’s cruel hand. And how does Melville’s novella end? In the end each man lies dead, but even in death one is still good and one is still evil, and the vacillating Captain Vere is left standing. But here there are no Captain Veres. There is no middle. Whose side are you on? 2. Well, after a KEY focused on cataclysm and Armageddon, Jose always finds it’s good to lighten the mood. So here goes. One reporter asked Curt Euro about "mystique and aura" or some such nonsense at yesterday’s press conference. You know what? As they say in ads for securities "past performance does not predict future results." And unless "mystique" is that blue chick from the X-Men and she’s wearing pin stripes, mystique don’t mean a damn thing. So please Yankees, rely on ghosts and fairies and unicorns and long dead sluggers. Depend on your vaunted history to protect you. After all, it worked for the Soviet Union. Didn’t it?